We’d love your help. 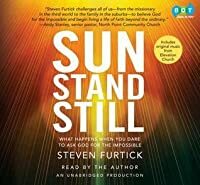 Let us know what’s wrong with this preview of Sun Stand Still by Steven Furtick. If you're not daring to believe god for the impossible, you may be sleeping through some of the best parts of your Christian Life. "This book is not a Snuggie. The words on these pages will not go down like Ambien. I’m not writing to calm or coddle you. With God’s help, I intend to incite a riot in your mind. Trip your breakers and turn out the lights in your favorite hidin If you're not daring to believe god for the impossible, you may be sleeping through some of the best parts of your Christian Life. "This book is not a Snuggie. The words on these pages will not go down like Ambien. I’m not writing to calm or coddle you. With God’s help, I intend to incite a riot in your mind. Trip your breakers and turn out the lights in your favorite hiding places of insecurity and fear. Then flip the switch back on so that God’s truth can illuminate the divine destiny that may have been lying dormant inside you for years. "In short, I’m out to activate your audacious faith. To inspire you to ask God for the impossible. And in the process, to reconnect you with your God-sized purpose and potential." To ask other readers questions about Sun Stand Still, please sign up. Now, I realize that he may or may not be your cup of tea - he's definitely got a "grew up in the South & around church" vibe - but that video cut through a morass of self-pity & frustration in my ministry & life. He blends "inside baseball" humor (well, "inside ministry life" humor) with great expository teaching & incredible encouragement. In November of 2009, I was given a free ticket to the National Outreach Convention in San Diego... and Steven was the final speaker. You can read one of the points of his message in his blog post, Give Me My Rocks... but there was more to what he said. This gawky 29 year old kid (yes, the fact that he would have been in one of my youth groups makes me a little crazy) challenged & encouraged a group of convention-weary pastors/leaders with humor, passion & capital "T" truth. A bit ashamed of myself for groupie-like behavior, I went up after the convention was done to meet him & tell him how much his video on The Nines had meant to me. And here's why I'm not sure I can give his book a completely objective review - Steven hugged me (was NOT expecting that) and prayed for me, right there in the middle of a crowd of well-wishers. I don't remember much of what he said (still stunned from the bear hug) but his humility & exuberance won me over... in part because it's all too easy for me to live/minister out of pride & duty. Some days, it seems like my passion for Christ & for people has been boiled down to simply getting the job done. 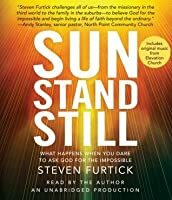 So, with all that background/biographical information, now I'll attempt to review Steven's first book, Sun Stand Still: What Happens When You Dare To Ask God For The Impossible. This book is not a Snuggie. The words on these pages will not go down like Ambien. I'm not writing to calm or coddle you. With God's help, I intend to incite a riot in your mind. Trip your breakers & turn out the lights in your favorite hiding places of insecurity & fear. Then flip the switch back on so that God's truth can illuminate the divine destiny that may have been lying dormant inside you for years. In short, I'm out to activate your audacious faith. To inspire you to ask God for the impossible. And in the process, to reconnect you with your God-sized purpose & potential. I figure the best way for me to review a book by an author that I'm rooting for is to try & judge the book by this simple question: does he accomplish what he set out to do? The short answer, at least for me, is "Yes." From there, the author takes us along on his personal journey as the pastor/church planter of Elevation Church... and shares multiple stories of people whose lives have been changed by audacious faith. * how can I have a big vision when I'm just an "ordinary" follower of Jesus (aka "not a pastor")? * what happens when God doesn't answer your audacious & faithful prayers? With his characteristic humor & solid Biblical foundation, Steven has written a book that manages to encourage followers of Jesus to passionately ask God to move on our behalf for His glory... and to do so without using false guilt to motivate people to pursue faith. Pastor Steven Furtick is regularly criticized for his lax use of Scripture, his shaky theology, and his over-eager charm, but there is no denying he is gifted and talented. While I'm somewhat in the Reformed camp who has claimed doctrinal war against guys like Furtick, I personally love his ministry. I appreciate what he does. I download podcasts from Mark Driscoll, Matt Chandler, Timothy Keller, James MacDonald, and anyone else you'd call conservative, but my odd blip on the iPod is Steven Furt Pastor Steven Furtick is regularly criticized for his lax use of Scripture, his shaky theology, and his over-eager charm, but there is no denying he is gifted and talented. While I'm somewhat in the Reformed camp who has claimed doctrinal war against guys like Furtick, I personally love his ministry. I appreciate what he does. I download podcasts from Mark Driscoll, Matt Chandler, Timothy Keller, James MacDonald, and anyone else you'd call conservative, but my odd blip on the iPod is Steven Furtick. I don't always agree with what he says, but that shouldn't count him out. When he says the truth, it lands hard. Furtick has three main objectives: to understand the size of our God we pray to, to seek a vision the size of that God, and to persevere amidst unanswered prayers. These goals culminate into his favorite phrase, audacious faith. He bases all this off a passage from Joshua that may or may not demonstrate proper exegesis, but is certainly catchy. It's a real zinger to say Sun Stand Still. The last point, about fighting even when prayers seem to fail, is the most nuanced part of the book. It's also his best sermon in the series. That single chapter touches so close to the daily reality of many people. Finally Furtick stops making God sound like a genie. When you strip away all the inspirational cheerleading of Furtick's preaching and writing, you get a sense that he sincerely understands the depth of our struggles. I wish that last point had taken up more of the book. It's almost as if Furtick sat down in the pulpit, turned off his iPad, and got really real. Our faith cannot be in goals, he implies, because our faith can only be fully found in God Himself, who is good beyond our understanding. It spoke so well that it eclipsed (pun intended) nearly everything else. Every once in a while you read a book that intersects with where you are in life in such a way that it's almost conversational. This has been that book for me. It has encouraged me on my journey. Joel Osteen wannabe, with a lot of God sprinkled in. When I saw Steven Furtick at the Willow Creek Association Global Leadership Summit this year, I was drawn in by his personality. You could tell that he believed he could change the world. This book helps one to dig deeper into his mindset. I feel genuinely encouraged in my walk. The first time I had heard of Steven Furtick was when I picked up this book. Evidently he is a pastor of a very large and successful Church and movement in the southern states. Admittedly, even in first picking up this book and perusing the first few chapters it is hard to get a complete picture of the man and his methodology. In fact, it wouldn't be surprising to find many who might be prone to reading a certain degree of cynicism in to what at first glance gives the appearance of a superficial The first time I had heard of Steven Furtick was when I picked up this book. Evidently he is a pastor of a very large and successful Church and movement in the southern states. Admittedly, even in first picking up this book and perusing the first few chapters it is hard to get a complete picture of the man and his methodology. In fact, it wouldn't be surprising to find many who might be prone to reading a certain degree of cynicism in to what at first glance gives the appearance of a superficial Gospel presentation on blessings, miraculous works and prayer and healing. From his own self admission, he is not a scholar or a theologian. He was not at the top in school and does not have a penchant or huge desire for the wordiness of strong academics. Nevertheless though, there is something about the passion that seems to bleed from these pages that entices you to keep reading. And for those who give this book a shot, the full read certainly reaps rewards. It will cheer you on in faith, excite you in vision and get you excited about the possibilities of your life under God. As I mentioned, there is no denying this man's passion. It is contagious, infectious and affecting. What he lacks in academic prowess he certainly makes up for in undeniable story, testimony and experience and focus. In fact, it is his methodology itself that proves to be the most compelling parts of Sun Stand Still. Rooting itself in the story of Joshua, it spends the first three quarters asking us to imagine the impossible being possible. It asks us to imagine a world in which we, people like Joshua, can in fact see time stop and the sun stand still. And he makes a fervent and impassioned plea for the modern Christian to adapt a similar degree of faith. One can refer to his language as somewhat over the top as he speaks without apology of this one sided point of view in which there is no middle ground. It's a call to avoid disclaimers, to avoid any thoughts and doubts of purpose and motivation, and to simply claim the possibilities that God has already declared to be true. God can and wants to heal. God can and wants us to have victory over the hardships of life. God can and wants to see those who can't have children and who desire to have a child be able to conceive. God desires to see masses come to Christ. God desires to see ministries grow, marriages flourish. So quit dancing around the truth of it and speak it in such as way that you believe it can and will happen without apology and reservation. It is following chapter after chapter of hearing this repeated vision that Furtick eventually reaches the chapter that he says he would rather not have to write. It is titled "When the Sun Goes Down", and it is the chapter that moves from this focus on the possible to the disappointments we find in the reality of life. And it is a powerful chapter that exposes the wonder of his methodology. He writes with purpose, and His purpose is to call us simply to pray, believe and act with conviction and confidence that is not burdened or limited by the reality. He gives all that he can to this notion before bringing us to what he calls the reality of the process. That is, sometimes God doesn't answer our prayers and doesn't come through in situations in the way we have asked Him to, and sometimes we see the miracle and sometimes we have to be the miracle when the miracle doesn't happen. And in all circumstances, the true blessing is the opportunity to be shaped by the process that marks the struggle that obedience brings when we act in full confidence and faith. By putting us face to face with this reality this late in the book he effectively allows us to hear this (and encounter it in our own lives) in balance while still retaining the truth of his plea on the other end. The fact that the sun does set and doesn't always stand still does not excuse us from speaking, acting and praying with the sort of confidence that believes it will. Approaching life and God in any other way simply sells who God is short, and who we believe God to be is the most important thing of all, regardless of what any outcome looks like on the other side. Doing it in this way paves the way for us to hear the full truth and still be left with an unwavering desire to live our lives with the "audacity" to pray for what we believe God can and desires to do. On the front end, I feel it's only fair to admit that when I first received this book, I was not a big fan of Steven Furtick. In my admittedly limited experience with the young megachurch pastor, I had found him to be brash, over-the-top, and borderline arrogant... not exactly qualities I look for in a preacher. Of course, I have generally found that it hasn't been an issue with what he has said so much as how he has said it ( this video is a good example). Since my problems with Furtick have be On the front end, I feel it's only fair to admit that when I first received this book, I was not a big fan of Steven Furtick. In my admittedly limited experience with the young megachurch pastor, I had found him to be brash, over-the-top, and borderline arrogant... not exactly qualities I look for in a preacher. Of course, I have generally found that it hasn't been an issue with what he has said so much as how he has said it ( this video is a good example). Since my problems with Furtick have been primarily about his methods rather than his message, I was interested to see how he came across in his first book. I wanted to give him the benefit of the doubt, and hoped this new medium would help me to understand what he's really about. The premise of the book is that most Christians fail to live life to the fullest, and never take advantage of the awesome power that is available to us through the indwelling of the Holy Spirit and access to the Father through prayer. Furtick's main Scriptural text for the book is Joshua 10 , where Joshua commands the sun to stand still. His assertion is that God wants to answer "Sun Stand Still" prayers for all his children, and stands ready to do so if only we will come boldly before the throne and ask God for the impossible. There are positives and negatives in the way the book works this out. First, the bad: Unfortunately, much of Furtick's bravado comes through in his writing, leading passages of this book to be almost maddeningly unreadable. From his overuse of the word "audacious" to his exhortation that people stop praying stupid, timid prayers, I found my eyes rolling several times. Also, at points this book sounded very much like the self-help pseudo-spiritual nonsense of prosperity preachers like Joel Osteen (whom Furtick has defended on multiple occasions ). If I hadn't been provided a free copy of the book for review purposes, I probably would not have continued. Thankfully, I'm glad I did, because it turns out there is also a lot of good in this book. Once I got over my bias against Furtick's writing style, I began to realize that there is some theological depth here where it is lacking in the type of guys who usually write books like this. Just because many books and sermons about praying for God's miraculous intervention make claims beyond what Scripture supports doesn't mean that the basic idea isn't biblically sound. After all, we do worship a God who is capable of stopping the sun and "able to do far more abundantly than all that we ask or think" ( Ephesians 3:20 ). Personally, I do have a tendency to pray safe, timid prayers rather than trust God to supply all my needs. Where this book is at its best is in a chapter a little past the halfway mark called "When the Sun Goes Down". It was here I felt the book hit a turning point, and I actually quite enjoyed the rest of it. In this chapter, Furtick balances out the "pray with bold expectation" sentiment with the reality that "sometimes — a lot of times, honestly — it goes the other way. Sometimes the sun doesn't stand still. Sometimes the sun goes down... sometimes the sun keeps sinking down, down, down, and no amount of hoping, fasting, or right living seems to stop it." This is where the prosperity theologians go badly wrong. Many times, our prayers are not answered (or the answer is no), no matter how fervently we trust in God. It can really shake one's faith. What do we do then? Furtick's answer is right on: keep trusting God, and look for ways to glorify Him through your setback. The rest of the book includes many practical suggestions for improving one's prayer life. These suggestions are good ones, and were personally challenging. Readers are directed to "reconcile your dreams with God's desires", using God's Word as a measuring stick for whether our prayers are according to God's will. We are also to "push while you pray", meaning that often the answers to our prayer often require taking action even while praying that God would act. As Furtick points out, there is a process between the promise and the payoff, and it is often during this process that God is seen and felt most powerfully. The type of prayers which require a miracle are frequently accompanied by uncertainty, anxiety, change, and sacrifice, but these are the very things that form our character and deepen our walk with the Lord. My final analysis? While I still don't like Furtick's style, I recognize that there is plenty of room in God's Kingdom for different methods. I still question some of his teaching, but finished this book encouraged that there is much more to Steven Furtick than I had previously given him credit for. I would not recommend this book for those whose discernment I do not trust, but there is much to be gleaned here. I look forward to seeing what comes of Furtick's ministry, as he is still only 30, and has many years of preaching and (hopefully) growing ahead of him. A very easy-to-read book, but to its merit, not its fault. I think that this book is great for those who feel like they are in a spiritual or prayer rut, and are looking for how to grow in their faith. This book may not have been terribly deep on a theological sense, but it inspires and encourages readers to live their faith. Rather than keeping it all in ideological headspace, Furtick gets practical and gives rubber-meets-the-road advice for your life. "Audacious faith" - that is the key phrase in Steven Furtick's Sun Stand Still: What Happens When You Dare to Ask God for the Impossible . The subtitle says it all - What Happens When You Dare to Ask God for the Impossible. The story of Joshua asking God to cause the sun to stand still in the sky, that the Lord's words may come to pass, is that backdrop to this challenging, inspiring book. In the same way that Joshua possessed an audacious faith to ask God for what seemed impossible, we are to "Audacious faith" - that is the key phrase in Steven Furtick's Sun Stand Still: What Happens When You Dare to Ask God for the Impossible . The subtitle says it all - What Happens When You Dare to Ask God for the Impossible. The story of Joshua asking God to cause the sun to stand still in the sky, that the Lord's words may come to pass, is that backdrop to this challenging, inspiring book. In the same way that Joshua possessed an audacious faith to ask God for what seemed impossible, we are to live a life of this same type of faith. What are you expecting God to do in your life? Are your expectations vague? Or are they too simple? Maybe you are expecting God for something that really doesn't impact anyone around you? God desires to do more than we can imagine! Furtick pushes you to dream way beyond the ordinary, and to consider believing God for the impossible - which, to God, is anything but! The premise of his book comes from the Old Testament story of Joshua and the taking of Jericho. Joshua had faith-an "audacious faith"- and he prayed an impossible prayer that only God could answer. That is the type of prayer life we are to have as Christians. The author uses many stories and examples in a conversation style of writing to get his point across. Furtick's writings are not mired in a deep theological discussion, rather he provides plenty of scriptural references for further research and study. He calls the audience to become prayer warriors through an "audacious faith" and Sun Stand Still prayers. I would diffidently recommend this book to new believers, need-a-jump-start believers, and die-hard believers. Really any believer will find nuggets of truth that speak to the heart. If nothing else find out the meaning to an "audacious faith." So pick up a copy of the book. And begin your journey of deepening your faith and praying a Sun Stand Still prayer. Your world will never be the same. "Jesus didn’t die on a part-time cross. He doesn’t love us with a part-time love. He doesn’t cover us with a part-time pardon for sins. There’s no such thing as a part-time Christian, and there’s no such thing as part-time ministry." "Complete confidence in the competency of Christ matched with sincere humility. This is the only formula for authentic audacious faith." 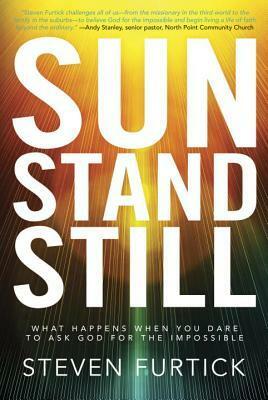 Sun Stand Still is about intense radical faith. Based Joshua's prayer that resulted in God keeping the sun in the sky for an extra "Jesus didn’t die on a part-time cross. He doesn’t love us with a part-time love. He doesn’t cover us with a part-time pardon for sins. There’s no such thing as a part-time Christian, and there’s no such thing as part-time ministry." 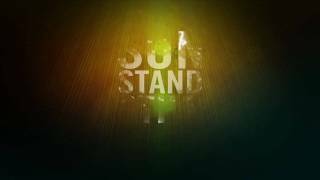 Sun Stand Still is about intense radical faith. Based Joshua's prayer that resulted in God keeping the sun in the sky for an extra day Furtick talks through what is looks like to pray you're own "sun stand still prayer." Read this, if only to gain exposure from a mega church but don't read this to learn. There were a few things I found uncomfortable with this pastor and his church that lean toward the unhealthy. A church is not successful based on its numbers. A healthy church has the majority, if not all serving. His church is 12,000 and only a few thousand serve. He mentioned that he doesn't even know the roles in his church. The pastor needs to know each person, because in the end he is accountable for his flock Read this, if only to gain exposure from a mega church but don't read this to learn. There were a few things I found uncomfortable with this pastor and his church that lean toward the unhealthy. He mentioned that he doesn't even know the roles in his church. The pastor needs to know each person, because in the end he is accountable for his flock. Serving in the church is the direct affect of salvation. He mentioned that his performers performed, and then were saved a few months later. It a lot of I, me, look what I did. Such an inspiring and motivating book, written in a way that is relatable, easy to read and Biblically-founded. I was also pleased that Furtick had a vision for this novel, used Joshua as the main biblical parallel and did not stay from this vision or Joshua's audacious faith example. Parts of this book led me to tears in recognizing God's goodness and at other times because of how much I know I need to change in my own life. I've been following Christ for more than several years now and found thi Such an inspiring and motivating book, written in a way that is relatable, easy to read and Biblically-founded. I was also pleased that Furtick had a vision for this novel, used Joshua as the main biblical parallel and did not stay from this vision or Joshua's audacious faith example. I've been following Christ for more than several years now and found this to be a beneficial read, one that I am and have been looking to apply practically in my own life. Ugh....I started this book after hearing an associate pastor at my church preach an uplifting message from it and while I HAD been enjoying it, I felt pretty slimey about the pastor who wrote it after I read [quite a bit more] about him (here's a bizarre starting point: http://www.crosswalk.com/blogs/christ...) -- a great reminder to do my homework when it comes to finding authors whose messages I want to follow as they relate to my faith. Amazing and challenging. This book is a poke on our backs so we start paying attention to the life we're living. Is it a faith driven life, or a fear driven life? Its encouraging to read that it is possible to live a life of audacious faith, and this way have the best life God has planned for us. Amazing and challenging. This book is a poke on our backs so we start paying attention to the life we're living. Is it a faith driven life, or a fear driven life? Recommends it for: anyone who dares to believe the Bible is true. Loved the book; its going into my personal library. Written in a way to wake you back up to the radical truths of the Bible. Re-charging, re-firing, reminding the believer that God's power, and unusual ways have NOT passed away; dare to ask and believe. To pray daring, outrageous, world changing prayers. Excellent book. First book I've read by Furtick and I love how down to earth his writing style is- very easy to read. And the thoughts and approaches to faith and prayer are so positive and purposeful- I will work to use these along with his 12 audacious faith confessions on page 114 daily. I liked it because of the message. He seems to be a speaker who writes, but his passion and message are powerful. It definitely lit a fire under me regarding the vision I was give several years ago. If you desire to do GREAT things for the world to the glory of God then I recommend this book. A non fiction book that I actually loved! This book doesn't discourage you with crazy expectations. It actually encourages you to not lose faith in that big prayer that you have and to get into the word and stand on the promises of God. Has changed the way I pray! Impacted how I pray and what I pray for. Maybe an upcoming series? Never did I expect to start the year with the right book - if such a thing does exist. A lot of things happened recently, one thing led to another, and here I am sitting in awe, trying to process everything I've absorbed from this book. I've always loved Pastor Steven and the messages he brings to life - be it via his weekly sermons or books. This one is a good reminder that we are the Joshua generation and therefore, to just (barely) survive our day-to-day lives is completely unacceptable. Salva Never did I expect to start the year with the right book - if such a thing does exist. A lot of things happened recently, one thing led to another, and here I am sitting in awe, trying to process everything I've absorbed from this book. I've always loved Pastor Steven and the messages he brings to life - be it via his weekly sermons or books. This one is a good reminder that we are the Joshua generation and therefore, to just (barely) survive our day-to-day lives is completely unacceptable. Salvation in Christ has already been ours and we can come boldly to the throne of The Most High God with our Sun Stand Still prayers - asking God for what is humanly impossible, for His glory. "If you ever encounter a theology that doesn't directly connect the greatness of God with your potential to do great things on his behalf, it's not biblical theology. File it under heresy... And further still: if the size of your vision for your life isn't intimidating to you, there's a good chance it's insulting to God." A much needed publication in the Christian community about doing more and seeking more, through faith. Too many times I've heard someone say along the lines of "believe and have "If you ever encounter a theology that doesn't directly connect the greatness of God with your potential to do great things on his behalf, it's not biblical theology. File it under heresy... And further still: if the size of your vision for your life isn't intimidating to you, there's a good chance it's insulting to God." A much needed publication in the Christian community about doing more and seeking more, through faith. Too many times I've heard someone say along the lines of "believe and have faith" as if that's all you need. False, you need work with faith. "There are going to be many points along the way when you're not going to have anyone around to motivate you or encourage you. And in those moments, you'd better be able to open Gods Word, look in the mirror, and remind yourself of the truth." No one is given small visions. No one dreams of doing the absolute least possible and living the smallest life possible. Stop using faith as an excuse to do little. It's not easy but, you have to go after your visions and dreams with faith. Sight unseen. "Every time God presents a significant opportunity, it's formed in the crucible of crisis. It's connected to danger. And it comes at a great cost." In Sun Stand Still, Pastor Furtick uses the story of Joshua and the battle against the Amorites (Joshua 10:1-15) to illustrate and define the idea of "audacious faith," or the boldness to dare to ask God for the impossible. In the story, Joshua prays that God will keep the sun from setting over the battlefield so that the Israelite army can defeat the Amorite army once and for all. In response to Joshua's prayer, God makes the sun stand still in the sky. Many would argue that making the sun stand In Sun Stand Still, Pastor Furtick uses the story of Joshua and the battle against the Amorites (Joshua 10:1-15) to illustrate and define the idea of "audacious faith," or the boldness to dare to ask God for the impossible. In the story, Joshua prays that God will keep the sun from setting over the battlefield so that the Israelite army can defeat the Amorite army once and for all. In response to Joshua's prayer, God makes the sun stand still in the sky. Many would argue that making the sun stand still is an impossible feat, but believers in God know that He is all powerful and that nothing is impossible for Him. Furtick argues that God has a plan for all of us, and that if we are bold enough to ask, and faithful enough to follow, that God will use us to accomplish impossible things for His glory. Furtick says that activating your audacious faith starts with designing a "Page 23" vision for your life. This involves accepting two basic truths: God is good and God is strong. He has called each of us to a purpose and step one is all about discovering what the calling on our lives is and trusting in God to fulfill that purpose. In this step, Furtick says to "build a case" for your Page 23 vision. This means that you make your request of God based on his proven character, promises in the Word, and his actions in the past. I found this step to be rather interesting, because it is directly tied to two areas of my faith that I struggle with: prayer and trust. Confession 1: I'm not a big prayer, by which I mean it is not my "go to" in times of need. Don't get me wrong, I pray, but not as often as I should and probably not in the way I should either. As I thought about it, I realized that the majority of my prayers where really just generalized requests for blessings. Not that there is anything wrong with these types of prayers, but when I read this section of the book, I felt challenged to reconsider how I pray. In times of crisis, my first thought is to compile the evidence and make a list of possible solutions with their pros and cons. I don't usually turn to prayer (a.k.a. God) first. I'm too used to trying to go my own way and not relaying on others to fix my problems. When I do pray, I also don't often back my prayers up with scripture or examples. I like the idea of this, because when you stop to consider who God is, what He has promised, and what He has done for you or others in the past, it makes my current prayer seem a lot less impossible. Confession 2: I sometimes struggle with faith because it requires trust, and trust is not something that comes naturally to me. Basing your prayers on the character, promises, and actions of God, makes trusting that God will deliver easier. If He promised it, did it in the past, or did it for someone else, why wouldn't He, if it is part of His purpose, do it for me? For me, adding this element to a prayer gives it more weight, a foundation, and makes it feels less like just a shout into the void. This step also spoke to me strongly. Another confession: I consider myself an analytical thinker (probably too much at times). When I am faced with a challenge or problem, I take the time to think through all the information available to me. I consider the pros and cons of each option. I seek out the advise of others. I sometime agonize over choosing the right option. Decision making is hard for me, but once the decision is made, I generally have no trouble following through with it because I have done my due diligence. This is why I like this step. Being specific forces you to really think about what it is that you are praying for. It makes you consider what you really what and what your motives are behind the prayer. It also forces you to consider the consequences (both good and bad) of what you are praying for. What is considered "humanly impossible" will be different for each person, but taking the time to consider what we are praying for is important and not something that I really considered before reading this book. This is perhaps one of the biggest challenges when it comes to prayer, and I confess that I have been guilty of it too. We pray for something and then we sit there and wait for God to deliver. Pastor Furtick argues that having audacious faith is not a passive activity, instead you have to "push while you pray." In other words, at the same time you are praying for impossible things, you need to be taking steps toward your Page 23 vision. Just standing still is not enough. If you move forward, God will put opportunities in your path and remove obstacles, but only if you are willing to move. I found this to be an intriguing idea, especially since I have always been taught that prayer is "passive," that we should "wait on the Lord." I found it interesting that we can still "wait on the Lord" and be active at the same time. Joshua prays for God to make the sun stand still, but he also marches all night long with his troops to the top of the cliff. He was not passive while he waited for God to deliver on his promise. Perhaps the most important step is this one, but again, it's also one that is overlooked often, especially in our culture, which values the individual above all else. Pastor Furtick reminds us that it is important to praise God not only at the end of our journey, but along the way too. There is nothing that we can accomplish without God, because everything we are and everything we have comes from Him. Review: A challenging, profound and inspiring description/instruction of how to gain a deeper relationship with God. Furtick is in your face, honest, and takes no prisoners; favorite quotes say it all. Favorite Quote: "If the size of your vision for your life isn't intimidating to you, there's a good chance it's insulting to God." (p. 7); “You will never know what it is like to experience God’s power in this way until you have the audacity to believe and pray and act in the confidence that our G Review: A challenging, profound and inspiring description/instruction of how to gain a deeper relationship with God. Furtick is in your face, honest, and takes no prisoners; favorite quotes say it all. I would consider the most important point of the book to be on page 193. "The tiniest seed of faith, applied and exerted consistently over the course of time, can move the biggest mountain in your life. Having the faith to start small in the face of the most overwhelming odds is about as audacious as it gets." Furtick was not referring to having faith for himself, but for other people. It was worth the time it took me to read it. I appreciated his discussion of God's sovereignty and how it inter I would consider the most important point of the book to be on page 193. I had a few moments throughout the book where I wanted to put it down and be frustrated. But God is working in me and He helped me to continue on until the end. It's a wonderful and powerful message that anyone can apply to their lives and their personal story. I highly recommend for anyone and everyone! I totally enjoyed the book. It’s a new look at an old promise fulfilled by God to His faithful servant, Joshua. We can have those same “sun stand still” moments in our lives if our faith is alive and active. I recommend this book to anyone who wants to expand their faith &prayer life to be more “in tune” to God’s promises and seeing them fulfilled. The message in this book is audacious and life-changing. If you want your life to be different...better. If you want to make your world better; and if you want to walk in the miraculous, then this book’s for you. I loved this book. The way Steven challenges the believer in faith and prayer, all backed by sound Biblical fact- it spoke to me. What a read. It'll fire up your faith, to be sure. I definitely needed a book like this and I'm grateful for the lessons and reminders found in it!